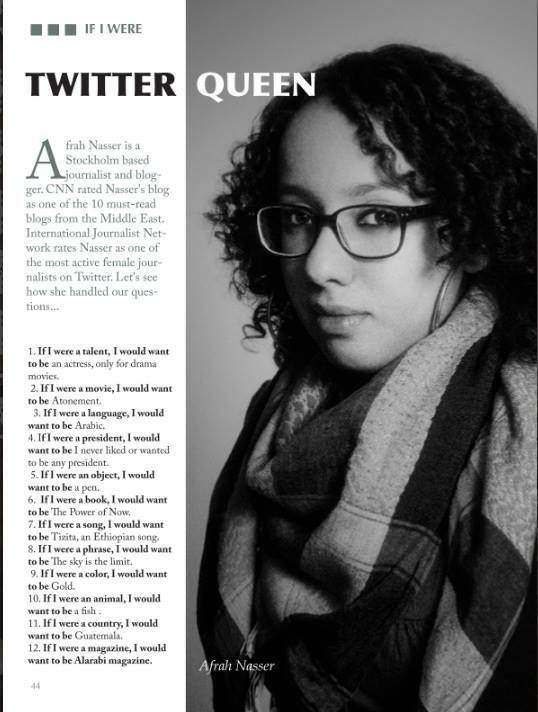 Feels unbelievable to be featured on a magazine I used to work at, Yemen Today Magazine! If I were a talent, I would want to be: An actress, only for drama movies. If I were a movie, I would want to be: Atonement. If I were a language, I would want to be: Arabic. If I were a president, I would want to be: I never liked or want to be any president. If I were an object, I would want to be: A pen. If I were a song, I would want to be: Tizita, an Ethiopian song. If I were a phrase, I would want to be: The sky is the limit. If I were a color, I would want to be: Golden.